John Middleton roots in tobacco date back to the founding of a small Philadelphia tobacco shop in 1856 to serve customers seeking premium cigars and pipe tobacco. Today, Black & Mild machine made cigars have been one of the top selling pipe tobacco cigars on the market. Each of these machine made cigars are stuffed full of aromatic Middleton's Cavendish, Burley, and Virginia pipe tobaccos, sealed in perfectly designed binders and bundled up in a homogenized wrapper. A definite unique alternative for pipe tobacco smokers who want a pipe experience packaged nicely in a cigarillo format with a filtered tip. For decades Black & Mild machine made cigars have become a classic because they give a unique and high quality smoking experience offering a slow burn with a full flavor taste with a sweet aroma. Presented in natural and other delightful flavors, each cigar is fitted with plastic or wood tips allowing for a comfortable and easy draw, giving each and every user a pleasurable smoking experience that only a discount machine made cigar like Middleton Black & Mild’s can offer. 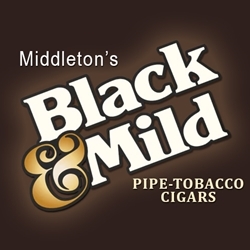 Considering Middleton Black & Mild’s are extremely popular on the market by cigar lovers everywhere who love and appreciate a good quality machine made cigar, Smokers Discounts believes you will value and love them too! We’ve made it easy and affordable to buy machine made cigars online. Call us for more details!